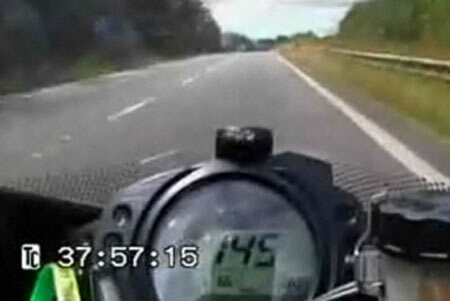 A CORNISH BIKER who filmed himself riding his 1000cc sports machine at speeds in excess of 156mph, prior to a fatal accident involving a fellow motorcyclist, has been given a suspended jail sentence. This morning's BBC News reports how Fred Bowden, 42, videoed himself and friend Andrew Prowse while riding at speeds of more than 156mph in Cornwall in July 2008. Later that day Mr Prowse was killed instantly when he collided with a car at Tolvaddon. Police say the incident was caught on Bowden's tank-mounted video camera. Bowden was given a 51 week prison sentence, suspended for two years, and a three year ban.